HOUSTON (AP) — For a team with championship hopes, it seems a bit silly for the Houston Rockets to be happy about being .500. 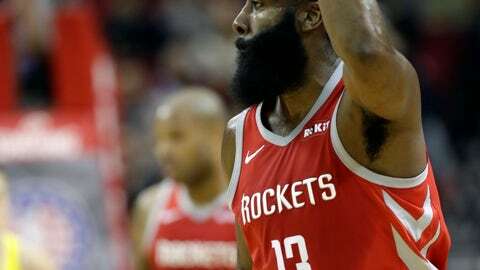 But after the way they started the season, the Rockets took a moment to appreciate their recent progress after a rout of Golden State on Thursday night improved them to 7-7. James Harden scored 27 points in Houston’s 107-86 victory in a rematch of last season’s Western Conference finals. The Rockets, who announced before the game that they were “parting ways” with 10-time All-Star Carmelo Anthony, have won three straight and six of their last eight games after starting 1-5 to reach .500 for the first time since they were 1-1. “I just told them: ‘Congratulations, guys. We’re .500. That’s really good,'” coach Mike D’Antoni said with a laugh. The Warriors, who got Draymond Green back from his suspension but were without Stephen Curry for the fourth straight game, have lost two of their last three. Curry has already been ruled out for Golden State’s next two games because of a groin injury. Houston had a 13-point lead after three and opened the fourth quarter with a 12-2 run to make it 88-65 and spur Kerr to call a timeout. The Rockets then scored the first nine points after the timeout, with six from James Ennis, to make it 97-65 midway through the quarter and put the game out of reach. Both teams cleared their benches a couple of minutes after that. Harden likes the attitude the Rockets have shown in clawing back after their terrible start. Kevin Durant had 20 points for the Warriors on a night they were just 4 of 18 on 3-pointers. Green had five rebounds and five assists in his return from the one-game ban imposed by the team for a dustup with Durant in Monday night’s overtime loss to the Clippers. Green addressed the situation for the first time after shootaround but did not apologize for his actions in the heated exchange. Durant was in no mood to discuss their relationship after the game, saying: “Don’t ask me about that again,” before turning away from the reporter who posed the question. While the Warriors dealt with the drama between Green and Durant, the Rockets were left to answer questions about the decision to move on from Anthony. Anthony played just 10 games after signing a one-year, $2.4 million deal during the offseason. The Rockets opened the third quarter with a 7-2 run to stretch the lead to 54-43. Harden scored five straight points to make it 63-47 on his 3-pointer with about 5 1/2 minutes left in the quarter. Golden State got going after that, using an 8-2 spurt to get within 65-55 a couple of minutes later. Gary Clark ended the run with a 3-pointer, and two more 3s by him within a minute of each other late in the third extended the lead to 76-59. It was 76-63 headed to the fourth. Warriors: Curry was with the Warriors on the trip but it’s unclear when he’ll return. “We’re going to be very, very careful, and obviously he’s going to need plenty of court time before he returns,” Kerr said. “When I say court time, I mean live action. He hasn’t had that.”… Kevon Looney scored a season-high 12 points. Rockets: Gerald Green returned after missing the last two games with a sprained ankle. … Ennis finished with 19 points and Eric Gordon had 17 off the bench. … Houston made 16 of 47 3-pointers. Warriors: Visit Dallas on Saturday night. Rockets: Host Sacramento on Saturday night.